Playing Time 45 to 60 min. It's the World of Dorkness! The Munchkins are now vampires . . . and werewolves . . . and changelings. Bash through the haunted house and slay the monsters. The OTHER monsters. You can't slay your fellow munchkins, but you can curse them, send foes at them, and take their stuff. Of course . . . This is a stand-alone game, which (of course) can be combined with other Munchkin games. And it's illustrated by John Kovalic. OF COURSE. 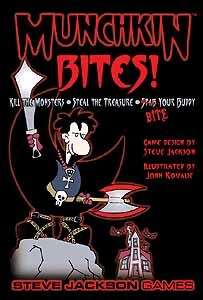 See Igor, Gilly, and all the other Dork Tower characters in their munchkin-vampire finery . . . So bring along your Coffin (+3!) and wield The Sword Of Beheading People Just Like In That Movie. Face foes like the Banshee, the Heck Hounds, and the dreaded Were-Muskrat. Smite them all, and be the first to Level 10 . . . The RDG Team hasn't gotten around to writing a review for Munchkin Bites!. YET. We're writing up new reviews all the time. (And adding new games to review!) And this one is on the To Do List. But we could really use your help! If you'd like to say a word or two about Munchkin Bites!, click here and we'll put it online! We're looking for more reviews and strategies for this board game. Submit yours here!